Does anyone know how to change the status bar text color? I want the text to be in the color orange. `UIStatusBarStyleLightContent`; or `UIStatusBarStyleBlackOpaque`; or whatever. There is no documented way to change the text color to orange. However, it is definitively possible, because I just tried it out and it worked. /// sets the status bar text color. returns YES on success. /// works in iOS 7. It uses undocumented, inofficial APIs. in iOS5 and iOS6 it may be possible too, but I haven't tried, because it is much more work. However I have found a method of interest (available in iOS 5 and iOS 6). Class UIStatusBarItemView has an instance method called -textColorForStyle: (which takes an integer and returns an object). You may be able to monkey-patch it to return any color you like. You can't change it to orange. Black and white are currently the only available status bar content / texr colors. The Apple UI guidelines mentioned that Don’t create a custom status bar. The default color of the content / text in the status bar is black and this can cause the status bar to become unreadable if the content behind the status bar is dark. 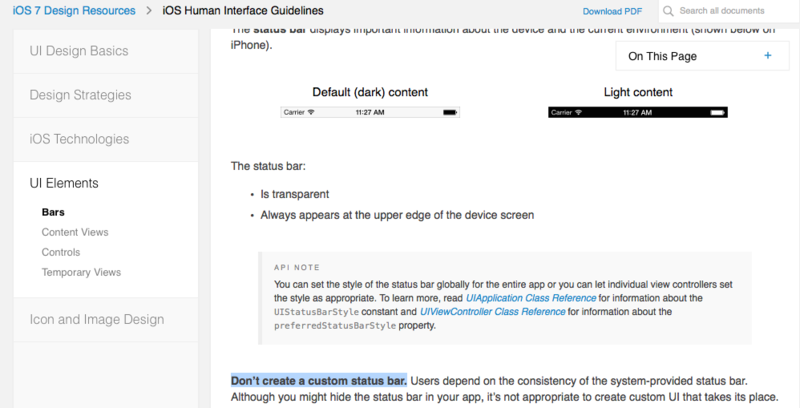 In order to remedy this issue you can set the UIStatusBarStyle of your application and/or views. UIStatusBarStyleLightContent changes the color of the content in the status bar to white; alternately, UIStatusBarStyleDefault sets the color of the status bar content to black. Not the answer you're looking for? Browse other questions tagged ios colors ios7 statusbar or ask your own question. Can I turn the error message “No visible @interface for 'FooClass' declares the selector 'bar'” back into a warning? How to log network performance data in iOS applications?